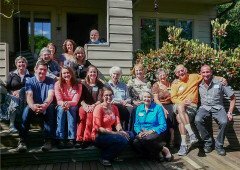 Volunteer Advocates work in their communities to improve education and increase access to Death with Dignity within the state of Washington by reaching out to the providers and organizations involved in end-of-life care. Volunteer Advocates help us connect with adult care communities, hospice organizations, pharmacies, physicians, and other communities who want to know more about the Death with Dignity Act and other end-of-life choices. It is meaningful work that allows for flexibility in schedule, and is best complemented by monthly meetings, access to technology, a willingness to drive, and some weekend or evening work, depending on your focus. Since our founding, the lifeblood of End of Life Washington has been our client support team. Our Volunteer Client Advisers work one-on-one with terminally ill people. By speaking openly and candidly about death without judgment and without discomfort, volunteers empower their clients to maintain choice and control at the end of life. No particular set of skills or experiences is required in order to be a Volunteer Client Adviser. Our volunteer team includes physicians, hospice workers, social workers, registered nurses, psychologists, nurse practitioners, chaplains, attorneys, and others. End of Life Washington provides training and ongoing support for volunteers. We are currently most in need of volunteers who are located in, or willing to drive to, Spokane and Skagit County, Washington. Please note we are NOT in need of volunteers in the Seattle area at the present time. Our needs do change, so please check back in a few months. If you are interested in finding out more about this rewarding volunteer opportunity, please contact us by emailing info@endoflifewa.org or by calling 206.256.1636. Contribute financially to End of Life Washington. Send letters to the editor, or write opinion pieces supporting choice at the end of life. Talk with your physician about your choices for end-of-life care. Volunteer in our office on Seattle’s First Hill. We need help making event packets. We appreciate and welcome your involvement in supporting those facing the end of life.